William Cummins', author of King and the Cowboy, next event is Tuesday, March 6th. The show has been in the works since July 10, 2011. • Saturday March 3rd at 2:00 PM visit Hope Reins Therapeutic Riding Program at Marcody Ranch in New Smyrna Beach which is featured in the book. • Sunday March 4th The Daytona News-Journal book editor, Karen Gallagher, will publish an article about the book and library show in Section G of the newspaper called MY Week. • Monday March 5th: the radio station WELE 1380AM will interview him at 11:00 in the morning on their “Movies and More” show with Bobbie Thomas. 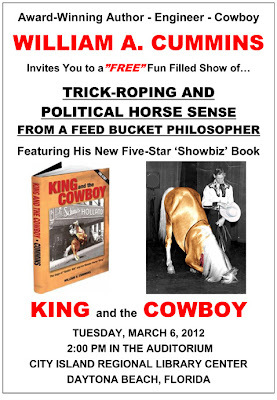 The public is welcome and encouraged to invite friends to join the fun at the show if you are in town. As you can see, your prayers are very much welcomed.